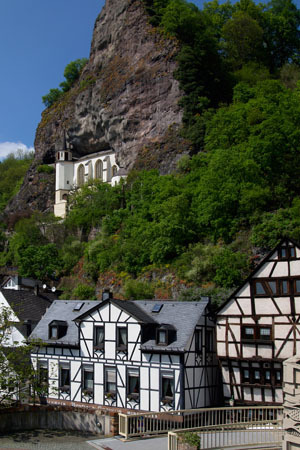 In the narrow valleys between steep, rocky cliffs and the banks of the Nahe River lies Idar-Oberstein. Since space is scarce here, the town has been developed over the river, and since 1986 the Nahe has flowed underneath the town for several kilometres. The world famous Felsenkirche (a church from 1482-1484), whose construction is traced to a story of fratricide, is built into a vertical rock wall high above the old town and gives Idar-Oberstein a unique appearance. The steep steps leading up to Felsenkirche are climbed every year by countless visitors from all over the world, and their efforts are more than rewarded by the impressive works of art there. Examples are a Gothic winged altar from 1410 and a beautiful Stumm organ from 1756. The setting of both the old and the new castles high above Felsenkirche gives the visitor a feel for how proudly enthroned above the town and valley the lords of Dhaun and Oberstein castles were in the Middle Ages. In addition to Felsenkirche, the town is well known for its agate cutting. There is actually no other excavation site in Europe as famous as the Idar-Oberstein region for its enormous variety of agates in different forms and colours. The origin of agates lies in the Permian period 285 million years ago and is attributed to the pronounced volcanism in the Nahe Valley. Agates fill hollow cavities in volcanic rock, although it is not exactly clear how the quartz accumulates in the cavities and is transformed to agates. Smoky quartz, amethysts, jasper and calcite were also formed during this time. Originally, agate cutters worked on the semi-precious stones from the region (commercially mining them from 1375 until1875) in their small cutting shops along the deep streams which flow from the Idarwald and Hochwald heights to the Nahe River. Today the raw stones are imported from all over the world. In addition to the agate cutting, a highly developed jewellery industry evolved, including the trading of precious stones and pearls. No wonder that Idar-Oberstein became one of the leading international centres for the jewellery industry, where dreams of agates, and other precious stones entice many. A few kilometres upstream from Idar-Oberstein the Siesbach, coming from the Hochwald heights, flows into the Nahe river. In former times this quite insignificant stream formed the border between the Roman provinces of Gallia Belgica and Germania Superior, and later between the jurisdictions of the archbishoprics of Trier and Mainz. During the years 1976/1977 a large Gallic-Roman burial mound was completely excavated at the headwaters of Siesbach in the forest-region "Kipp" at the foot of Hochwald. This find has more than local significance as the influence of the Roman culture on the native people of the Celtic Treverians can be impressively documented from both the contents and the decorations of the graves. It was used as a family burial ground between 167 and 174 AD by a distinguished and evidently wealthy Treverian family for three interment ceremonies and was completed around the year 175 AD. For an overview of the Celtic and Roman history an excursion to the museum in nearby Birkenfeld. is certainly worthwhile. A visit to the Gallic-Roman burial mounds near the town of Siesbach can be easily combined with a hike around the Idar-Oberstein region: follow Idarbach creek past the water mill "Weiherschleife" (with its water-driven tools for grinding and polishing agates), to the "peace oak". From there walk to Hettenrodt and then past Siesbach to the small forest road "Struthchaussee" at the foot of Ringskopf mountain. For those who prefer to travel in comfort, you can tour this area by car on a small road that begins in the town of Kirschweiler and passes the golf course below Kirschweiler Fortress. Johann Michael Stumm (1683-1747), was an organ builder of Hunsrück who was well known far beyond his own region of Sulzbach in the Idarwald region. He founded an organ building dynasty that produced more than 200 beautifully handmade instruments of excellent sound quality.